The First Kiss: Waxing Nostalgic! October 1, 2017 – This post was originally published October 1, 2013 and has been edited. In his crisp narrative style, SA Bradley runs the horror movie-devoted podcast Hellbent for Horror. Listening to it is indeed a pleasure. SA has introduced a number of key concepts for those of us who study and discuss horror fiction. One of these is “The First Kiss” – that first movie or piece of fiction which introduced you to horror and has left you a helpless addict. 30 Day Horror Movie Challenge – October 1st: Waxing Nostalgic! 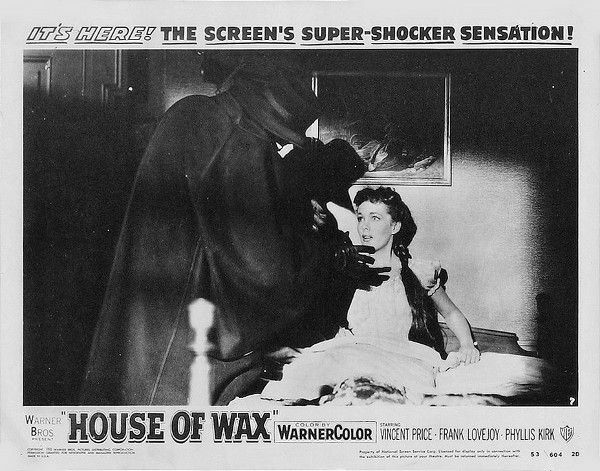 …one of three national TV channels (and the only ones) in the post-Franco republic aired 1953’s House of Wax . I couldn’t bear to watch it. I couldn’t bear NOT to watch it. It was the first horror movie I ever saw. I had a vague sense that I was afraid of ghosts and Dracula, and had never dared to see or read much about either. At that very tender age of 6 or 7 I may not have been able to fully appreciate House of Wax‘s sumptuous gothic look or the amazing talent of Vincent Price. But the thrills, the scares, the horrific imagery made their indelible mark in my little mind. You see, as the best of horror movies do, it teaches you that a monster is waiting for you right outside your bedroom window, ready to cross the line into the place you once believed was safe. There is a sequence where the heroine is stalked right outside her room, in the dark, foggy night. She was not safe from this hideous and sinister figure waiting to get her and just her. And if her, why not me? When it was advertised on TV, of course, I begged to watch it, and of course, after I did and tried to settle into a good night’s sleep, I couldn’t. I had to cry out for my parents, and beg and whimper to let me sleep next to them. I was in second grade. The following day ‘Casa de Cera’ was the talk of the schoolyard and we were enthralled, recounting the movie in hushed tones and whispers. A group of us clamored for our moms to take us us to Barcelona’s wax museum, where we further guaranteed ourselves, and by default our poor moms, a sleepless night by subjecting our eyes to the wax Draculas and Wolfmen. I now own a DVD copy of House of Wax. I can report that the skulking, stalky, what’s-outside your-window creepery still has the power to impress and horrify minds both young and old! The unwaxing of the fiend remains a strong horror experience. And the film’s eerie visuals and lush atmosphere are delightful. Classic, elegant and scary as always is Vincent Price as Professor Jarrod. The film also includes Morticia Addams protagonist Carolyn Jones and – get this – Charles Bronson as Igor! If you have a burning desire to add House of Wax to your DVD library, or to support this blog by browsing and shopping via this link, please consider clicking below.